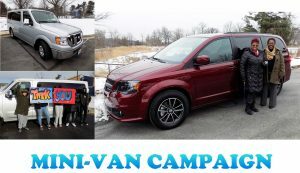 Thank you to everyone who donated and/or supported the Mini-Van Campaign. The success of the campaign enabled us to purchase two brand new mini-vans. The campaign began at FACES, raising $11,800. Fundraising efforts continued through “Giving Tuesday” and end of year donations (still trickling in) raising more than $25,000.